This Shabbat is one of the more complicated of the year. It of course is known for the regular portion of the week which happens to be Tazria, beginning a long discussion of skin conditions. It is also Rosh Chodesh Nisan and as such requires an additional reading recognizing the occasion. 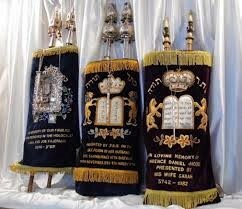 Finally, it is the last of the 4 special Shabbatot that take us from before Purim to just before Passover. It is called HaChodesh because it celebrates the fact that this is not just any Rosh Chodesh, it is the month of Nisan, which meant many things: it was the day the mishkan was assembled and it was the month we as a nation were born as well. Indeed, some actually consider this month to be the month of creation rather than the fall. As such we have the unusual requirement to read from 3 separate scrolls this weekend. But behind all of this ritual and symbolism is the emphasis on renewal: as individuals, as a nation and even as a world. We are accustomed to renewal in the fall but 6 months down the road things can also get a little stale, to wit, our spring cleaning of our domiciles and of our souls. Let’s greet the newness of the season and the holiday! Tribeca synagogue expresses its deep appreciation to Chava Chalom for sponsoring the security detail at every Shabbat during the month of Nissan in loving memory of her mother Aharona bat Tziona Kochava whose yahrtzeit is the 24th of Nissan. Aharona’s life took her from the persecution in Egypt and through 3 continents, all while raising a family and maintaining a deep devotion to her heritage. Future sponsorship for security detail at Tribeca Synagogue is always available! PLEASE register for our Pre Passover Spring Carnival this Sunday!! We are excited to welcome Launch Math + Science Centers camps to Tribeca Synagogue this summer! From engineering to electronics, kids learn all about STEM topics through an exciting summer program. Plus, Tribeca Synagogue members can receive an additional $50 off by using the discount code TRS2019 during checkout! Click here more information about Launch camps.